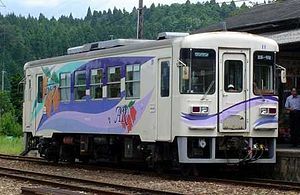 The Akechi Line (明知線, Akechi-sen) is a Japanese railway line in Gifu Prefecture connecting Ena and Akechi stations, which are both located in Ena. There are stations located in Nakatsugawa city as well. This is the only railway line Akechi Railway (明知鉄道, Akechi Tetsudō) operates. The third-sector company took over the former Japanese National Railways line in 1985. All stations are located in Gifu Prefecture. As of 1 April 2016[update], the line is operated using a fleet of five Akechi 10 series diesel railcars and one Akechi 6 series diesel railcar. A new Akechi 100 series diesel railcar (number 101) entered service on 8 April 2017, replacing the former Akechi 6 series car. The line opened on 24 May 1933, between Oi Station (present-day Ena Station) and Agi. It was extended to Akechi on 24 June 1934. Freight services were discontinued from 1 February 1981. ^ a b c d Terada, Hirokazu (19 January 2013). データブック日本の私鉄 [Databook: Japan's Private Railways] (in Japanese). Japan: Neko Publishing. p. 121. ISBN 978-4-7770-1336-4. ^ 私鉄車両編成表 2016 [Private Railway Rolling Stock Formations - 2016] (in Japanese). Japan: Kotsu Shimbunsha. 25 July 2016. ISBN 978-4-330-70116-5. ^ 明知鉄道 アケチ100形 [Akechi Railway Akechi 100 series]. Japan Railfan Magazine (in Japanese). Vol. 57 no. 674. Japan: Koyusha Co., Ltd. June 2017. p. 98. Wikimedia Commons has media related to Akechi Railroad.